Now you might think that this is a pretty simple question but if you think about it, this is in fact one of the great questions of our times! Let me show you, if we were to look at the most popular beliefs systems in our culture today, we would find two extreme views, in one end stand those who do not believe in God and at the other those who claim they believe in “something”, and like to call themselves“spiritual but not religious”. Now in case you are wondering what my answer was, after frantically searching my memory banks, this is what I said: “The reason why religion exists is because some people are given faith by God, you see religion is just an expression, our reaction to this faith. At its core religion is how we respond to God’s desire to have a relationship with us”. For Catholic’s everything we do and how we do it, from the sign of the cross to the way we receive communion is an external sign of our faith. The more faith we have the more significant these simple actions become because by doing them we come closer to God. The collection of all these little acts, the prayers, the liturgies, the songs, the crucifixes around our necks, the statues of Mary and the saints in our Sanctuaries are expressions of our faith. The more we embrace these the deeper we enter into our faith. Why is there religion? Because as long as there are believers in the world,men and women, who are opened to the gift of faith that comes from God, and they allow this gift to inform the way in which they think, feel and act, there will be a Catholic religion, a Christian Church, a church of Jesus Christ to serve as a witness to the truth of the Gospel. Amen? Now faith is a funny thing, it is not something we generate, but a gift from God. God gives us faith so that we can develop a desire to know Him. Of course we have the choice of embracing this faith or just ignoring this call. When we say that someone is “Very religious” or that someone is a “Holy Person” what we are saying is that someone has reacted in a positive way to this mysterious gift of faith we receive from God. 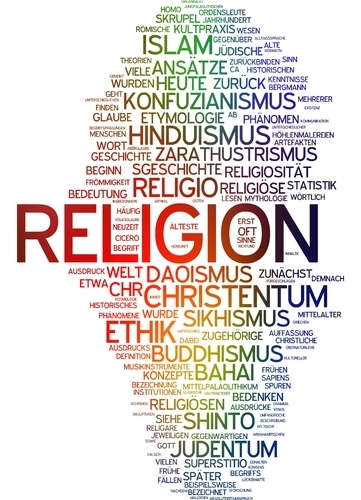 I guess what I’m trying to say is that Religion is what others see when we engage our faith; the more we embrace this gift from God the more religious we become and the more others experience our religion. My intention was to finish today right here, but then I caught myself watching the court proceeding of the poor soul who murdered the 9 people in a Charleston, South Carolina church. I was very moved as one by one the relatives of each of the murdered people forgave the assailant. Why is there religion? Because religion helps us reach down into the better corners of our souls, and gives us strengthen to live the way Jesus lived. God bless you all.